I’m into my third week in the SUBWAY Canada’s Commit to Fit challenge. The first week, Carl Savard, the Canadian Commit to Fit Ambassador, challenged us to complete a 20 minute daily activity. I started out walking in our neighbourhood. I surprised myself that I could actually do it and that I enjoyed it! It was nice to get out and get some fresh air. I even started sleeping better at night. Last week, I continued on with walking, but had a couple days where my pain flared up (unrelated to the walking). I had to take it easy on those two days and just did some light housework. When you live with chronic pain, there are some extra challenges and I have to listen to my body. Thankfully it cleared up and I was able to get back out there again. I don’t feel confident enough to venture too far from home yet. I like knowing that my house is nearby if I need to get there quickly. What is a “fresh swap”? It could be something as simple as swapping out the mayo on your favourite sandwich for some calorie-free mustard, swapping the drive to work for a walk, or swapping out time in front of the TV for an activity outdoors. If we needed some fresh swap inspiration, he suggested checking out the Commit to Fit app on the Subway Canada Facebook page. Many of the fresh swaps were pretty easy to do. For instance, I swapped an apple for dessert instead of a bowl of ice cream. Another fresh swap was a mug of herbal tea in the evening instead of a hot coffee. I also swapped pop for water and swapped parking near the door at the grocery store for a spot further back. Week three begins today! My task this week is to recruit a friend to help me stay motivated with the challenge. I also have to grab a buddy to do at least one workout with me this week. I’ve already been discussing the challenge with a good friend of mine online and she’s helped me to stay focused and positive. In terms of who my workout buddy will be, I have a few ideas. I’ll keep you updated on how it goes this week! 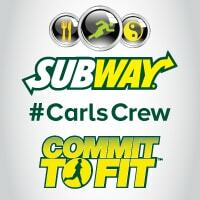 Follow me on Twitter, Instagram and Facebook and use the hashtag #CarlsCrew and #CommittoFit to follow the journey! Also, connect with SUBWAY Canada on Facebook and Twitter. Disclosure: I received compensation for my participation. All opinions expressed are my own. Swap out ice cream for frozen yogurt! Swap out whole milk for skim milk! we have swapped out 1% milk for the 2% we were drinking..next will be on to skim! Swap the beloved ice cream for yogurt! I could swap soda for Crystal Light. I would swap sweet Iced tea for cold water. I could swap sugary drinks for water. I could swap elevators for stairs! I swapped out ice cream for frozen yogurt, homo milk to 1%, mayo to mustard(tastes better), sugar drinks to water, coleslaw to green salad and feel a lot better for it. I now do 20 minutes cardio exercise indoors every second day and also go for a walk everyday for around 15 -20 minutes(depending on the weather). Swapped out my cream for 2% milk in my coffee. Swap cucumber slices for cookies …. they are crunchy.